Nach nur knapp 7 Monaten in Tucson Arizona im Reid Park Zoo wurde Snow letzten Montag völlig überraschend tot in ihrem Gehege gefunden. 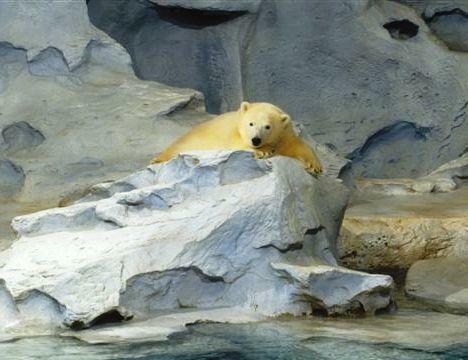 After only 7 month in the Reid Park Zoo, Snow was found dead in her enclosure last Monday morning. 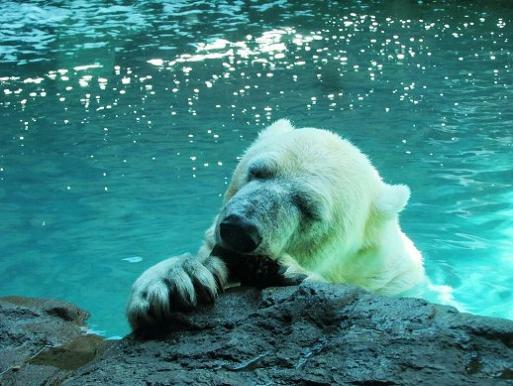 "We are very sad to announce that “Snow,” the Zoo’s 17 year-old polar bear, has died unexpectedly. She was discovered first thing this morning by her Zoo Keeper. She was in her normal sleeping position and location, with no signs of trauma. The Zoo’s veterinarian indicated that although she had chronic health issues, she was improving. She was swimming and eating well yesterday. We are proud of everything the Zoo staff did to provide Snow with a wonderful quality of life in Tucson. She will be missed." 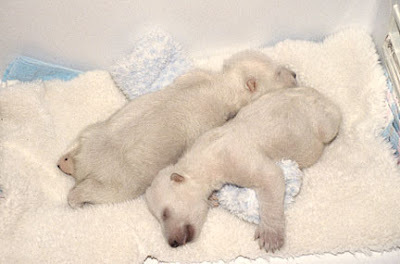 Snow was a polar bear with a very special story, she and her twin brother Klondike made headlines in 1994 as they were, similar to Knut, raised by their zoo keepers in Denver as their mother Ulu rejected them. Obviously she was not ready to raise the cubs, not only that she hadn't prepared for birth, she hadn't gained weight neither. "Usually, the body of a female polar bear will not let her eggs develop until her body has built up a large store of fat." Die nachfolgenden Bilder von der kleinen Snow damals mit ihrem Bruder hat mir Diane aus Canada geschickt, wofür ich mich herzlich bei ihr bedanken möchte.Sie sind zu lieblich! 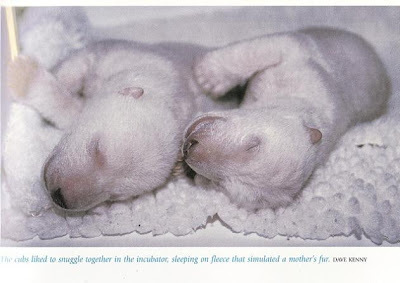 Thanks to our Canadian friend Diane here some pics of little Snow with and without her brother Klondike..
Kleine Snow, kleines Bäuchlein...mein Lieblingsfoto von der kleinen Maus! 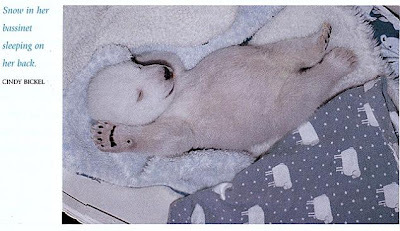 Until their first birthday the bears were raised by their keepers who even shared at times their sleeping bags with them. Differently to Knut and Thomas Dörflein the bears were raised by a team of three, so they could take turns.The bond between the bears and their surrogate parents stayed very close.It was an incident during feeding time when the bears were 8 months old, which showed the keepers that time for a change was due. 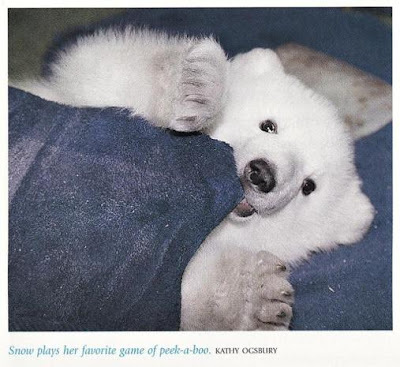 Klondike had cornered Cindy Bickel.Her colleague could help her and no harm was done but it became clear that the bears had outweighed their keepers and needed a place on their own. 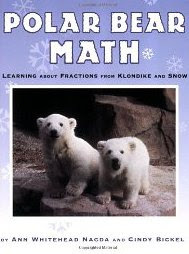 Klondike and Snow's story was published in a book. Find here an extract about Snow's and Klondike first year when they were raised by their keepers Dr.David Kenny, the zoo's senior veterinarian, and his staff, Cindy Bickel and Denny Roling. There has even been a children's book, doing math by featuring their story and the challenges of calculating the right amount of milk and other foods. 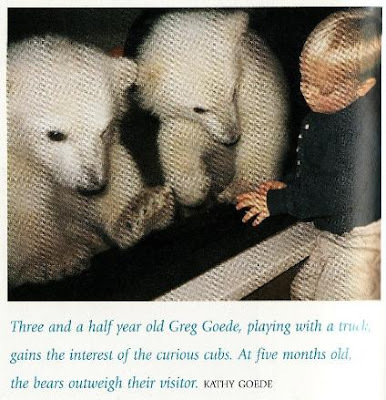 Klondike & Snow in Seaworld Orlando where they were moved at age one due to zoo space's constraints in Denver at that time, much to the despair of Denver's residents who considered themselves as the cub's extended family. Snow had a complicated medical history. She had rickets when she was young. 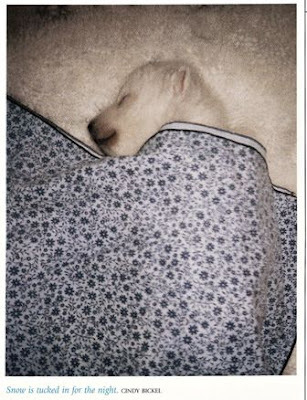 In recent years she developed serious skin allergies, which was the reason to send her to Arizona, it was hoped that the drier climate would do her good.After more than 17 years of living together, Klondike and Snow had to part from each other. 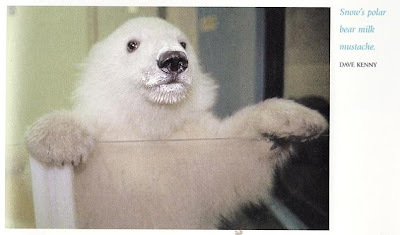 Klondike still lives in Seaworld Orlando. Time to say farewell to Snow. As for me her story is so much connected to the first year, here an enchanting video, which I like a lot. wherever you are, I am sure you will from time to time watch over your brother, won't you...? eine traurige Nachricht ist der Tod von Snow, deren Hautprobleme sich offensichtlich durch das Klima in Arizona gebessert hatten. Beim Betrachten der Bilder und die verschiedenen Berichte dazu, denkt man natürlich - wie könnte es anders sein - an Thomas Dörflein und Knut. Ob ich 1994 davon in der Zeitung gelesen habe, weiß ich nicht mehr. 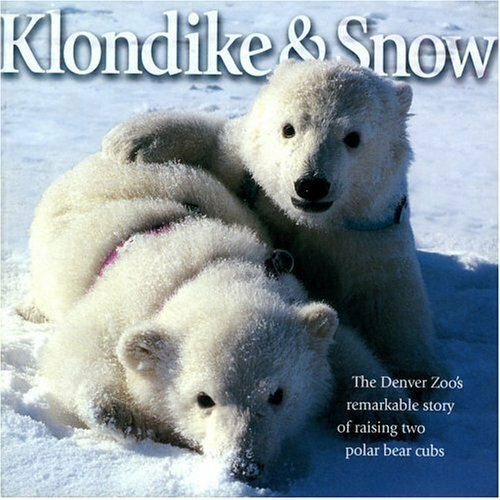 Aber in den Herzen der Menschen in Denver werden Snow und Klondike sicher auch unvergesslich bleiben. In Berlin wird Knuts kleine Anlage abgerissen und für die Lippenbären umgestaltet und vergrößert. Da fließen sich bei vielen Knutfreunden auch die Tränen. 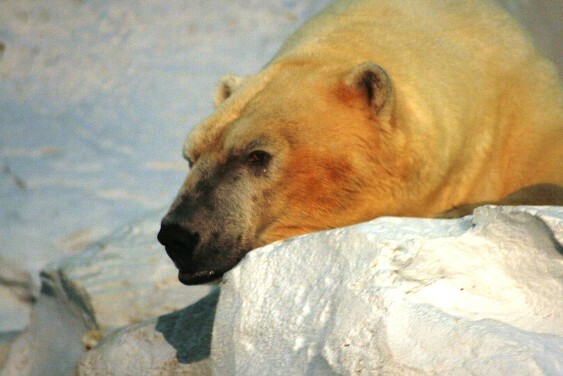 "A 17-year-old polar bear who died earlier this month at Tucson's Reid Park Zoo had suffered from an undiagnosed heart ailment. Zoo officials say Snow is believed to have suffered cardiac arrest brought on by an irregular heartbeat. Snow likely had the condition for several years, but because she had no symptoms, it went untreated. 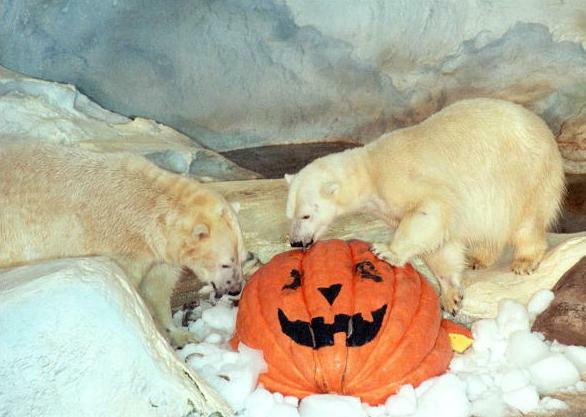 Zoo officials have decided against replacing Snow because polar bears aren't plentiful. The bear died on Sept. 3."